Our experienced team of builders and craftsmen has over 30 years of experience designing custom fountains and waterfalls. These custom water features are built using top quality materials to ensure durability and a long-lasting fountain. All custom sizes are available so you can find the one that best fits your space and budget. Our custom fountains and waterfalls add elegance and tranquility to your environment. They also work as natural humidifiers to help cleanse the air we breathe. We offer Free Shipping within the mainland USA. Call us today for discounts on custom fountains at 866-518-6849. Water Gallery L.L.C. 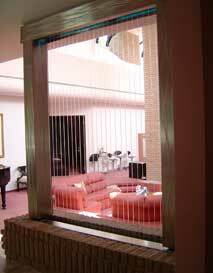 is known as the leading authority for exquisite custom indoor waterfall design. Our custom fountains and pre-designed indoor fountains are sold to a variety of residences and businesses throughout the United States. Our design team is comprised of a talented group of artisans and engineers that represent the leading edge of waterfall design and fabrication. These craftsmen use only the most durable and resilient materials so we can create and deliver custom water features that last. Water Gallery L.L.C. is dedicated to quality and fine detail. We are committed to delivering custom fountains that are far superior to anything else on the market. 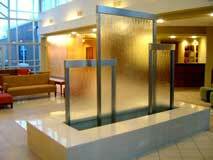 The "Stainless Triple" custom fountain is an elaborate focal piece for a business lobby area. It measures 8 ft tall by 10 ft wide and is constructed entirely of stainless steel with clear glass panels. The "Stainless Triple" custom waterfall makes a bold impression on all of its visitors. The "Floating Bar" custom fountain brings a soothing and elegant atmosphere to this residence. It is constructed of stainless steel and includes a "free floating" clear glass panel. The "Floating Bar" indoor fountain measures 9 ft tall by 5 ft wide and is the perfect indoor waterfall for many residential and commercial businesses. The "Glass Wave" custom fountain incorporates a unique S-shaped stainless steel reservoir concealed by custom cabinetry and solid surface materials. It consists of several "free floating" panels of clear glass and creates an incredible environment for both employees and clients. 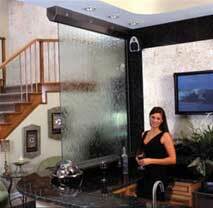 The "Glass Wave" custom waterfall measures 8 ft tall by 22 ft wide. The "Tall Glass" custom fountain pushes the boundaries using only one piece of tempered glass. It creates a beautiful center piece for this commercial lobby in Sarasota, FL. 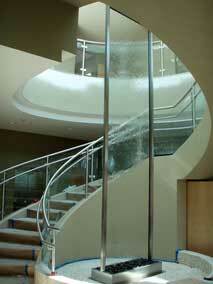 The "Tall Glass" custom waterfall is constructed entirely of stainless steel with a clear glass panel. 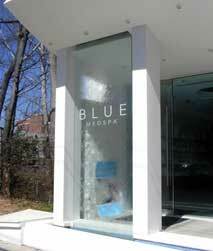 The "Blue Medspa" custom fountain is an exterior waterfall. It is a "free floating" clear glass fountain and is a beautiful "eye catcher" for passers by. This custom fountain measures 12 feet tall by 5 feet wide and resembles a fabulous example of our custom vinyl logos. The "Rain Curtain" custom fountain is a unique and intriguing design. It is constructed entirely of stainless steel with surrounding brick décor. The rain flows down durable mylar strands and the water is completely contained within this beautiful custom fountain. The "Rain Curtain" measures 8 feet tall by 5 feet wide. The "Lincoln" custom fountain is constructed entirely of stainless steel and measures 9 feet tall by 5 feet wide. The elegant silver mirror surface shows a perfect example of our custom vinyl logos. This indoor fountain leaves a lasting impression on every customer that enters the car dealership.